Each year, the Patricelli Center for Social Entrepreneurship awards three $5,000 seed grants to fund the launch or early-stage growth of a project, program, or venture. Eat At The Table Theatre Company, run by Kai Williams ’20, was one of this year’s winners. This is Kai’s second report since receiving funding from the PCSE in March 2018. You can read her first report here. The past two months have been a period of exciting growth at Eat At The Table Theatre Company (E.A.T.T. ), mostly due to the generosity of the Patricelli Seed Grant. In June, we were confronted with a major obstacle when we realized we could not obtain the licensing rights to “For Colored Girls Who Have Considered Suicide When the Rainbow is Not Enuf,” the production we originally aimed to perform. Faced with this roadblock, we decided to produce and create our own original piece, a poem-play tribute to “For Colored Girls” and Ntozake Shange. Although this decision felt risky, we wanted to explore the possibilities implicit in the idea. 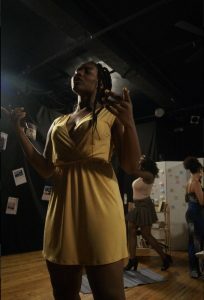 By devising this response, we could engage with the themes explored in Shange’s revolutionary play, while including experiences unique to our cohort and topics that affect womxn of color that were not discussed in the original show, such as queerness, cultural appropriation and w hat it means to be colored while attending a predominantly-white institution of higher education. 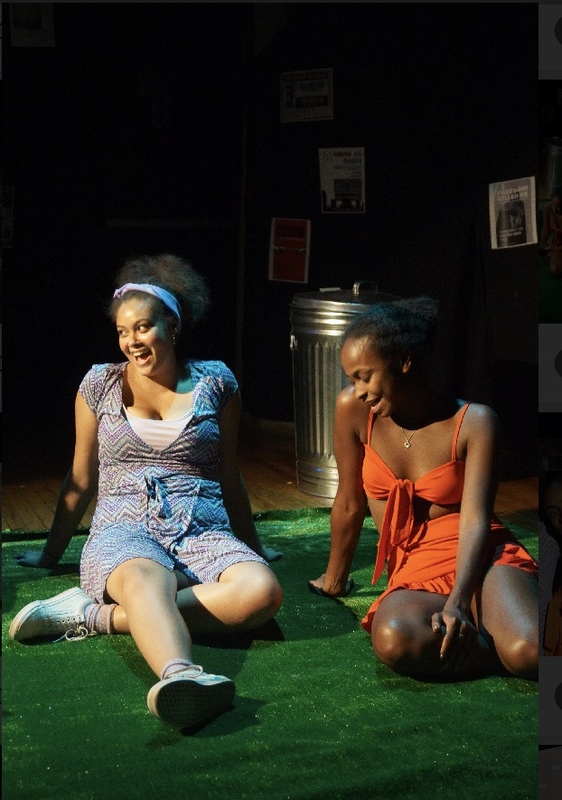 The first few weeks of rehearsals were dedicated to devising scenes amongst the actresses, discussing elements of our lives both at home and on campus and reaching out to young poets from all around the country to utilize their writing in our play. We ended up borrowing writing from many womxn and gender non-binary poets of color who are also Wesleyan students, including Caridad Cruz, Rachel Godfrey, Gisselle Yepes, Naomi Williams, and recent graduate Franchesca Peña. 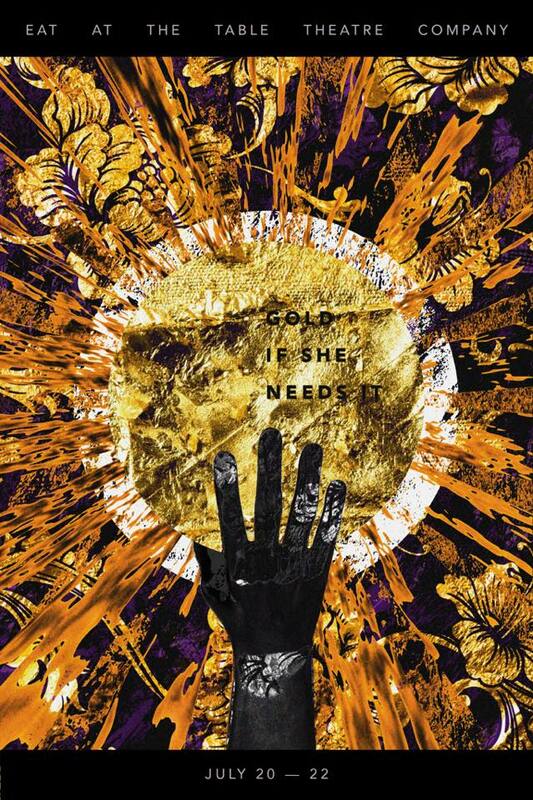 By the end of June, we had a finalized script and a title for the show, GOLD IF SHE NEEDS IT. From there on out, every week was spent rehearsing, organizing publicity materials such as social media accounts and posters, designing lights, music and sound cues, constructing set and costumes and getting set up in the theater. We were lucky enough to acquire a beautiful black box theater on 28th Street that could entertain more audience members than the previous year’s theater could. There were many challenges that arose from working with such an intimate crew and having so many responsibilities and tasks to complete; challenges such as figuring out the best way to stay under budget but also buy and transport as many materials as needed to construct a realistic and beautiful set, or ensure that we had enough rehearsal time for each of our actresses to memorize rather lengthy poems and monologues. But by mid-July we were (just about) ready to premiere our show. The show ran for three days. We filled every single seat, every single day. We also increased our profit by about 30% more in ticket sales than we made last year. 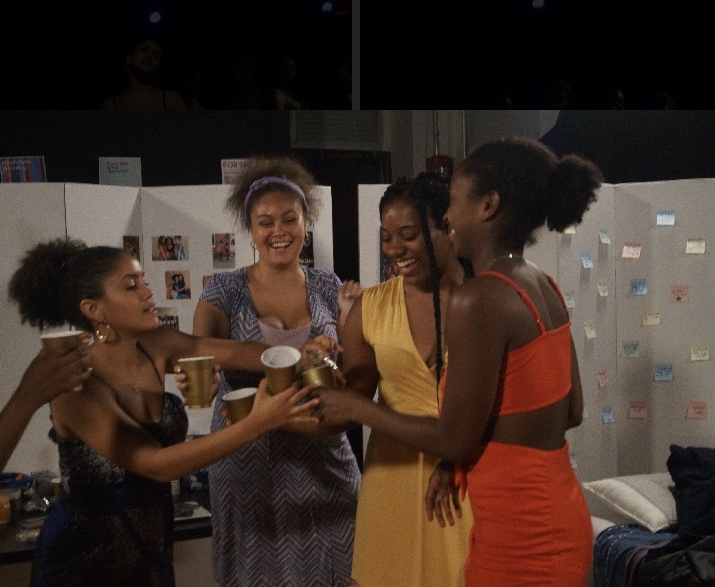 Our cast was larger, so I felt we had the opportunity to work with more young actors of color, and it was our first cast that consisted entirely of womxn. GOLD IF SHE NEEDS IT, essentially, exists to spin narratives about college cultures that are often not represented in media. Spanning the pre- and post-party antics of a Friday night on a liberal arts campus, five friends use poetry to explore, relate and celebrate their unique positioning as “girls for whom spaces are not made, but who run the world still.” I admit I felt incredibly proud, watching the audience engage with and react to the actresses and poets. Now that the production has ended, we are working to further develop this show and also to devote this upcoming season to fundraising. In January, we have been offered a reading at Bowery Poetry Club, where more people will be able to experience the show. Currently, my co-Executive Director, Emma, and I are working on devising strategies for fundraising events.